There is something about tin cans, I can’t help trying to find new ways to upcycle and reuse them. This leather pen pot has to be one of my classiest tin can upcycles. In the past, I’ve made gold crushed can DIY planters, a recycled jeans planter , Marimekko decorative tin can planters and have even upcycled tins with a faux marble effect. 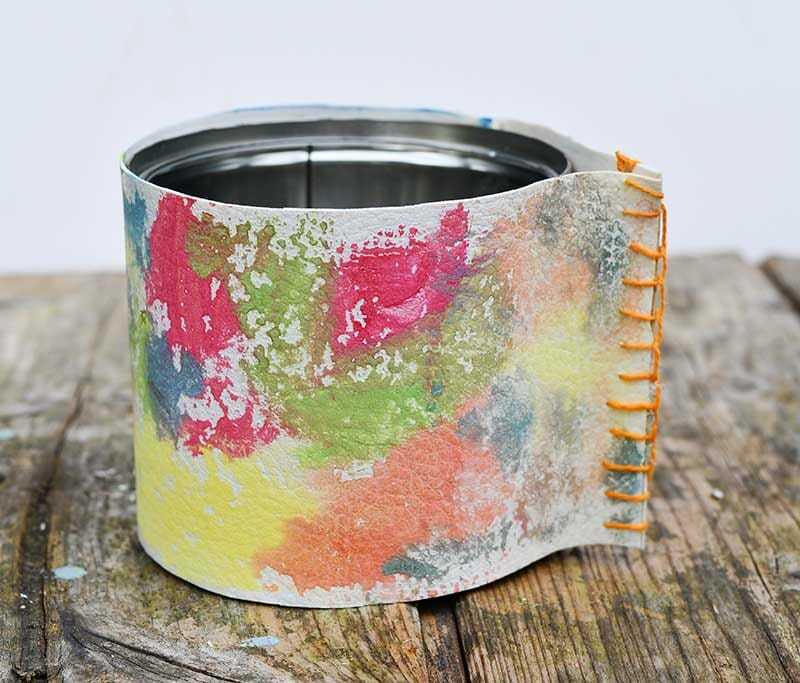 You can see many more of my upcycled tin cans here. 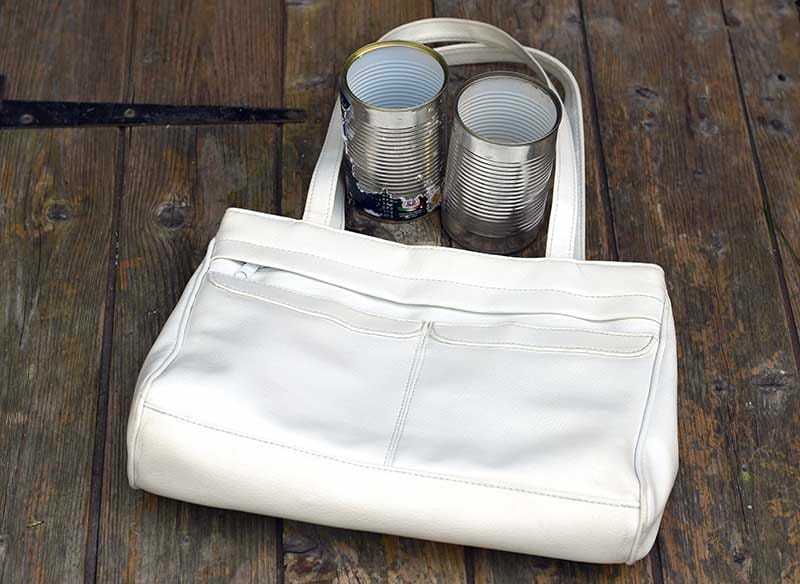 I was about to throw out a rather outdated white leather handbag when I got the idea of using it for my latest tin can upcycle. 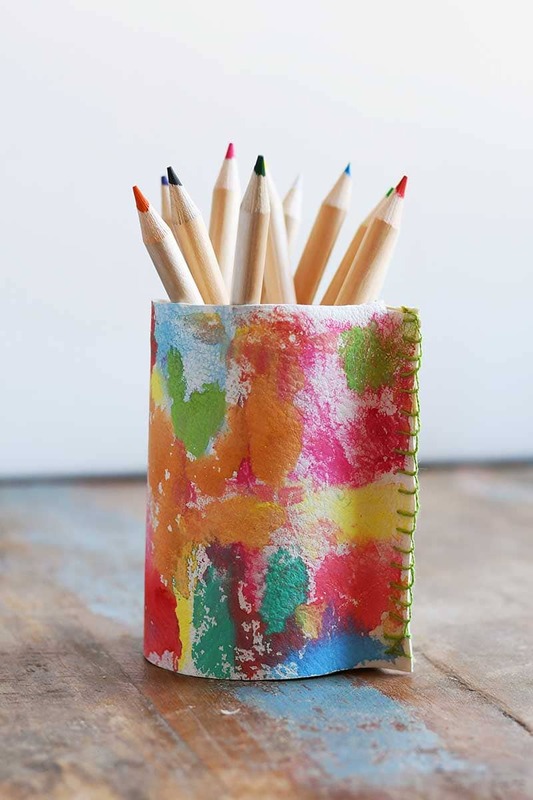 Having painted leather before for I thought it would be fun to add a rainbow of colour to the white leather and use this to make a fun leather pen pot. I say leather but the handbag actually turned out to be faux leather (so vegan-friendly!). Don’t worry if you don’t have an old handbag to hand you can easily pick a faux leather one up really cheaply at a thrift/charity store. Or even buy faux leather online. Also, I say leather pen pots, but they can just as easily be used as plant holders. 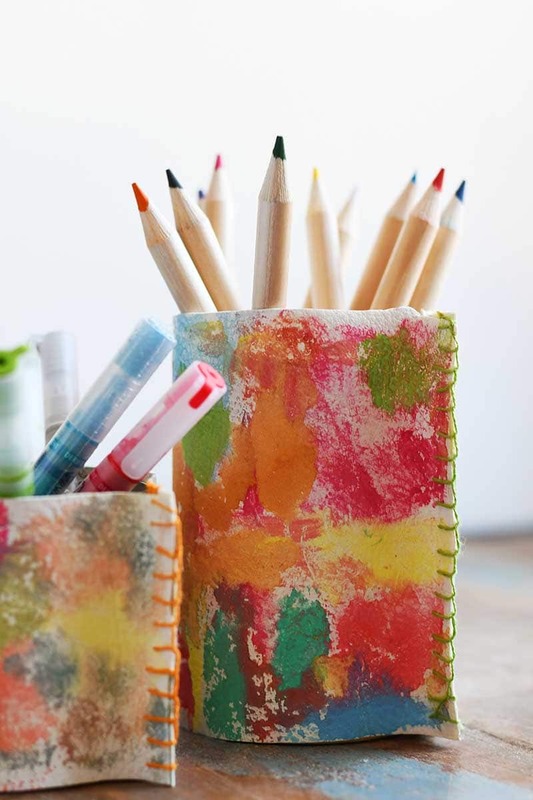 I think though because the leather pen pot is so colourful it looks great with all my colour pens in it. This is a really simple affordable craft that uses mainly upcycled materials and took about 30 minutes to complete. Tin cans – I used tin cans in a variety of sizes. White faux leather – from an old handbag or bought on line. I think the pots look better if you can get faux leather that has a bevelled texture. 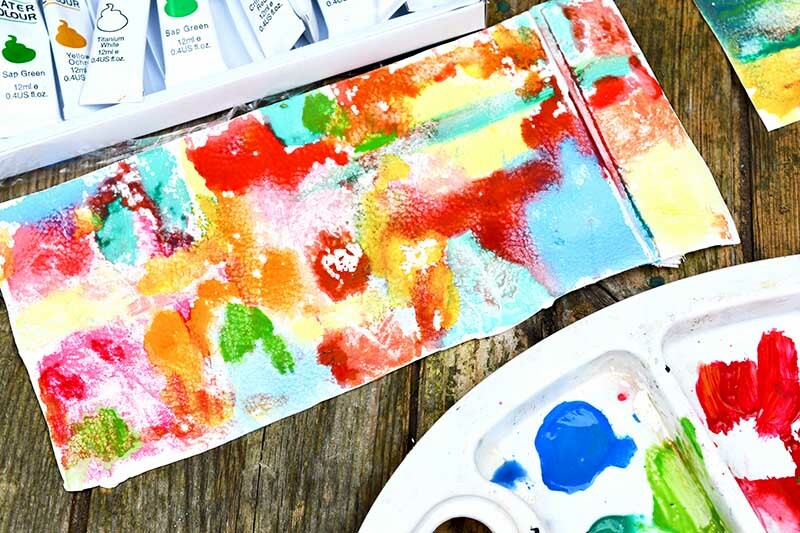 Watercolour paints – the paint in the tubes works best. Brightly coloured embroidery thread and needle. The first thing to do is to cut the faux leather to size. As I was using an old handbag, this involved cutting it open with a pair of scissors first and removing all the lining. 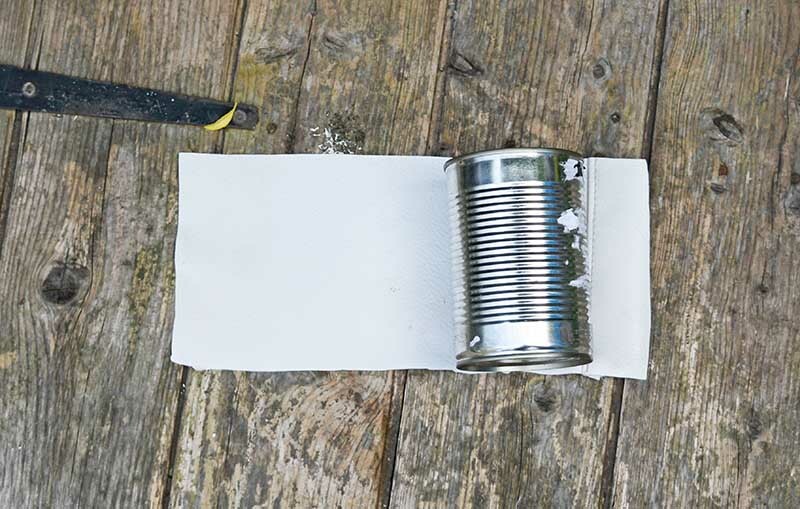 The piece of leather to go around the pot needs to be the same height as the tin can and about 2cm longer than the diameter of the tin can you are going to cover. Next paint the cut piece of leather with watercolour paints. As you first brush the watercolour paint on the leather you will notice that the faux leather appears to repel the paint at first but if you leave it a few seconds the paint will stick to the leather. It is hard to paint detail with watercolour paint but I liked the washed out effect it gives on the leather. 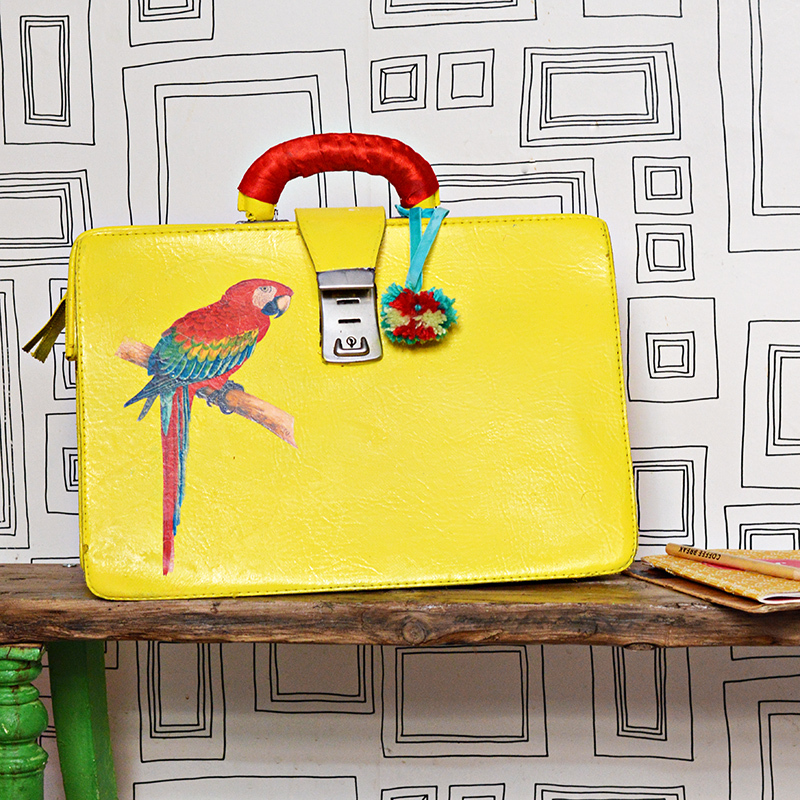 I just used lots of bright colours from my paint pallet to create a random rainbow pattern on the leather. 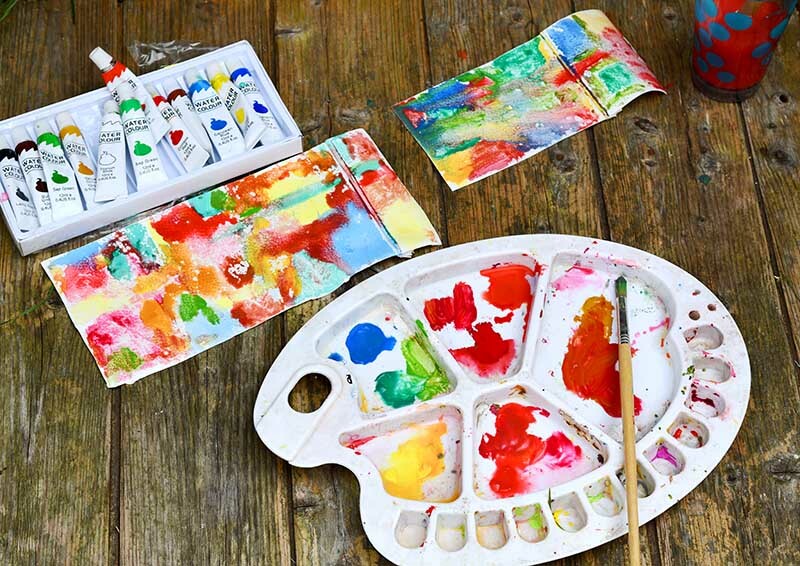 If you have never painted with watercolours there are lots of fabulous tutorials available. 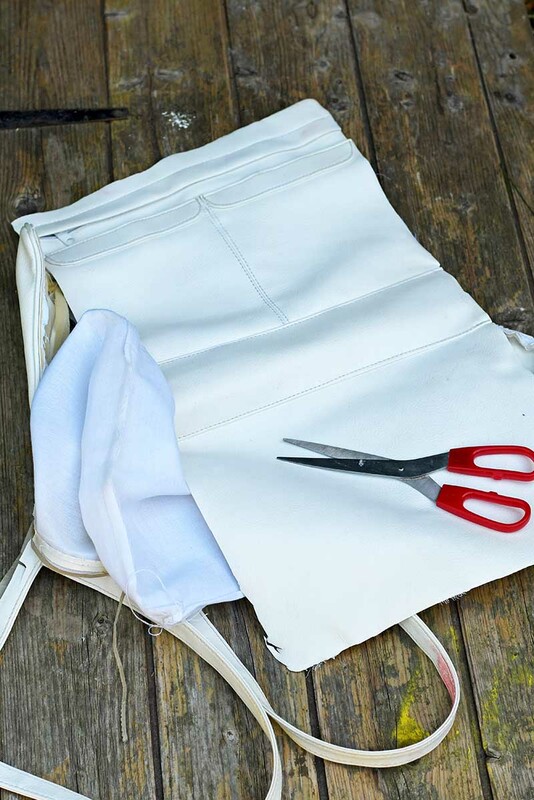 You may also want to practice on paper first before painting the faux leather. It shouldn’t take long for the paint to dry. I left my paint as it was, but if you want you can seal it with an acrylic spray sealer. This will probably give the leather pen pot a shinier finish. Once dry the sleeve is ready to sew. 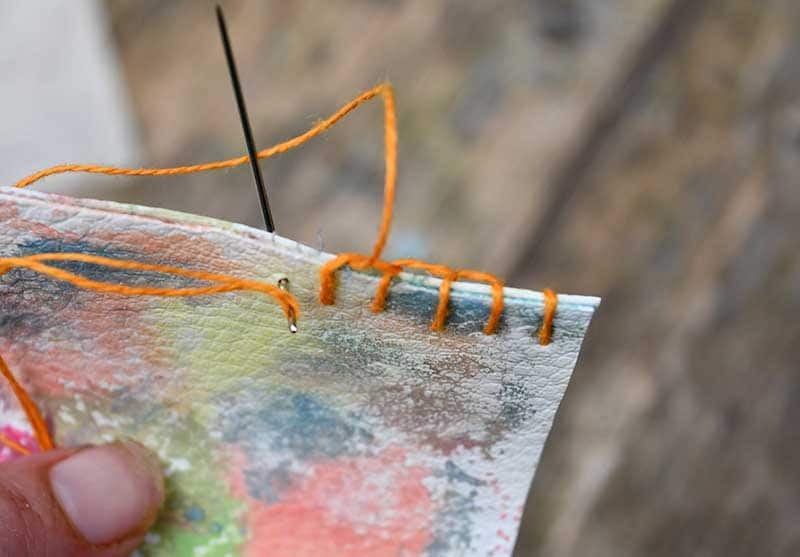 Stitch the two ends together with a brightly coloured embroidery thread using a blanket stitch. 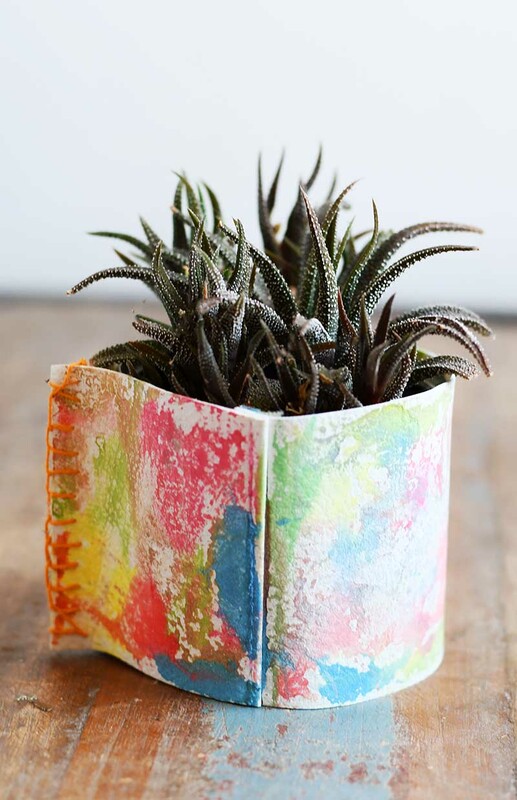 Finally, slip the leather cover over the tin can to create your lovely leather pen pot. Either way leather desk tidy or trendy planter I know they will both look great on my desk! 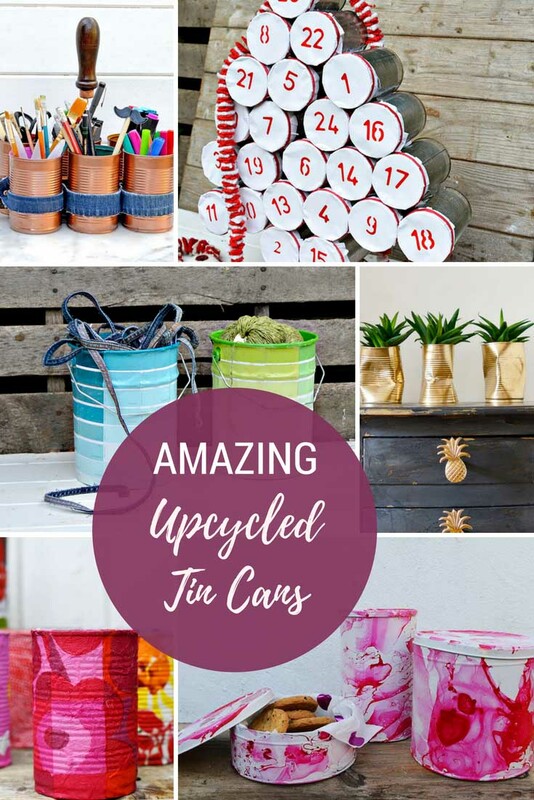 If you are looking for more tin cans upcycle ideas you can check them out here. This isn’t the first time I’ve painted leather in the past I have made an upcycled leather bag with paint and iron on transfers. If you are looking for more green crafting ideas visit favecraft.com. Thank you. The faux leather was so easy to sew the darning needle went through it like butter. Thank you, it does brighten up my desk. Love this idea. You were my favorite pick for this week on Waste Not Wednesday! Thank you, Deborah that’s awesome. Such a cute idea! It wouldn’t matter if the old bag had a mark or two on it either would it? Thank you, yes you could easily paint over the marks. This was a great idea. I cannot believe how these turned out. This is such a fun upcycle. I love the vibrant colors. It’s great when a craft is also practical. Thanks for sharing at Snickerdoodle. This is my Snickerdoodle Special Feature at this week’s party. Hope to see you at today’s party. Thank you, Beverly. And thanks for the feature. Thank you, Michelle. I did like painting the leather. 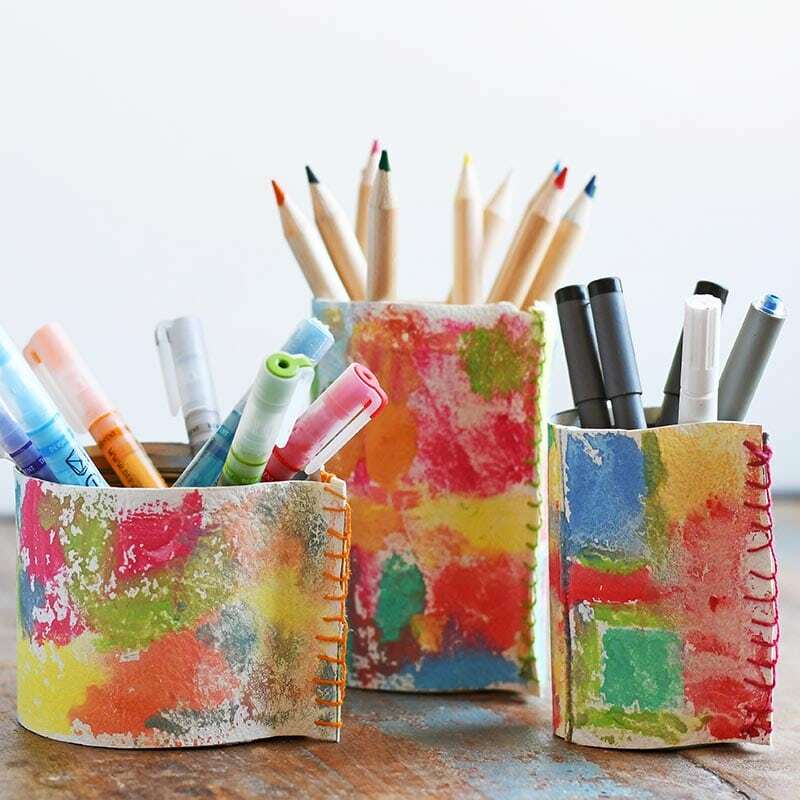 Great idea to reuse a purse and cans! Love the creativity and the pretty colors. Thanks for sharing at Merry Monday. Thank you, I do like colourful things. 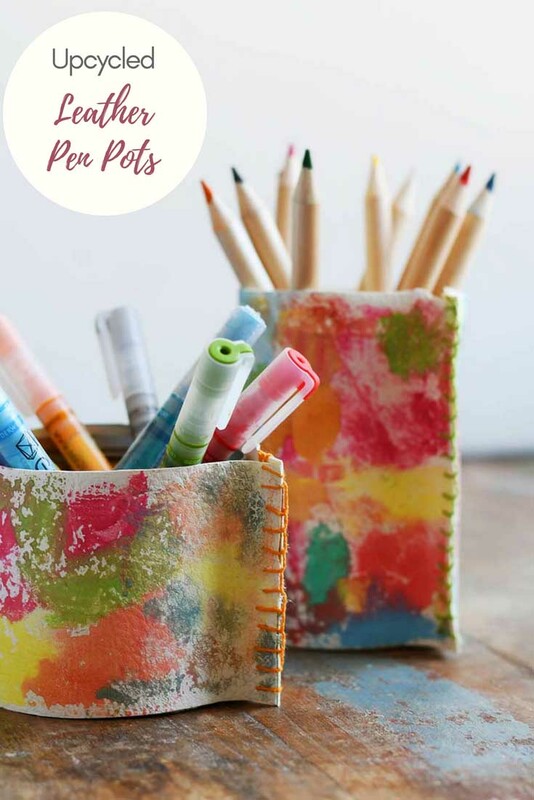 If this isn’t one of the cutest ideas to upcycle tin cans – I don’t know what is! I love your creativity, Claire! They are really pretty! Thank you, I love finding new ways to upcycle tin cans and this one was fun. I think it’s the colourfulness that makes them seem cheery. Great idea! I love this DIY! It will be so fun for kids to transform things! Thank you so much. It is fun to and simple to do.